Living room and family room activities are merging into the kitchen, and it's changing how kitchens look. Particularly as homes are getting smaller, we're using the kitchen for much more than we have in the past. Home owners want a more versatile floor plan and need to get creative with their space. The walls in kitchens started coming down in the 1980s and 1990s. First to go were walls separating the kitchen from the dining room and now home owners are saying goodbye to walls between the kitchen and the living room. Kitchens also are being designed in a less utilitarian way with larger windows, fewer cabinets, and softer lighting. Install a kitchen island. Kitchen islands not only have functional benefits but also provide space for entertaining, informal dining, and extra storage. If space is limited, consider a portable island, which can range from a butcher block to a breakfast table with bar stools. Just make sure that the style you choose is consistent with your existing decor in the kitchen and the size is appropriate. At least 3 feet is recommended between the island and walls so there's plenty of space to move around. If the kitchen island is large, add chairs to show it can serve as an extra gathering place. Furnish with comfy chairs. Skip the typical wooden stools for an upholstered bar stool with a back. Switch out traditional chairs around the kitchen table for wing chairs, a love seat, or even an upholstered bench. Soften the light. Use accent lights and sconces, usually associated with a hallway or den. Numerous small lamps also will create a softer effect. Hang a chandelier or light fixture over the kitchen island. Get crafty and add a decorative backsplash. Not only are backsplashes super functional behind the sink and stove, they can also be very appealing to the eye and can exemplify personal style. Glass tiles are very popular now, but so are ceramic tiles and tin panels which are particularly easy to install. Add storage. Extra storage is key especially in smaller kitchens. 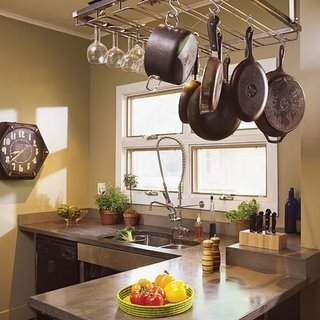 Consider a wall peg board or a hanging wrought-iron rack to hang pots and pans. Add a standalone cabinet, cupboard, buffet, or wall shelving. Stage cabinets with craft supplies to show that the space can serve many purposes. Display quality pieces. Take the artwork you may have once reserved for the living room and display it in the kitchen. Accessorize shelves with collectibles or books. For smaller kitchens, mount a mirror on one wall which will give the illusion of more space and reflect light. Make sure the basics are strong. If the bones of the kitchen aren't strong, fix those first. The condition of countertops, hardware, flooring, appliances, and cabinets aren't going to be covered up by creating a cozy atmosphere.